Is South Africa the richest country in Africa? What African countries were Colonized by the British? What are the 7 natural wonders of Africa? What are the best destinations for African Safari? Comprising an area of 11,730,000 square miles, Africa is the second largest continent on the planet. It covers 20% of land surface on earth. It has 54 recognized sovereign nations, two disputed states, and nine territories. Western Sahara here is a self-governing territory. The Indian Ocean is located to the southeast of Africa, while the Atlantic Ocean is situated to its west, and the Mediterranean Sea is to its north. The Red Sea and the Suez Canal are located in the northeast of continent, along the Sinai Peninsula. Africa is home to a wide range of wildlife, terrain, and climates. The continent is also rich in natural resources, particularly in minerals, such as gold, uranium, diamonds, platinum, and chromium. 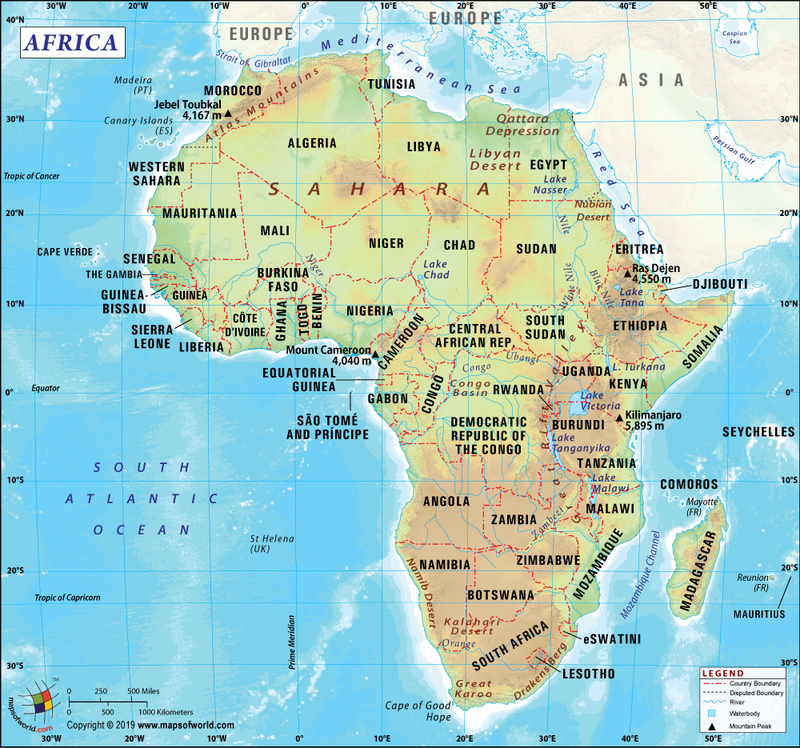 About Africa Map - The map of Africa depicts the various countries of the continent, the international boundaries and neighboring continents. Oceans and seas adjoining Africa are also depicted on the map. The map is also available in different formats. Click on any country to get its detailed map and description. Majority of the nations have a flag that uses Pan-African colors. Some of the nations that do not use Pan African colors include Cape Verde, the Democratic Republic of the Congo, Liberia, and Somalia. Africa is home to 1.2 billion people as of 2016 census, and accounts for 16% of the world's population. Considering the average age of population, Africa has the youngest crowd. The median age in 2012 was 19.7. Africa, especially Central Eastern Africa is considered the ‘cradle of man’ or the birthplace of civilization. There have been evidences supporting the existence of Hominidae clade (great apes) on the soil, can be traced back to 7 million years ago. Ancient Egypt is also believed to sustain the first literate society. Today, Africa is home to diverse and different countries, cultures, and people. What Countries are in Africa? There are 54 countries in Africa that are internationally recognized. The largest country is Algeria, and the smallest is Seychelles – an archipelago. In the mainland Africa, smallest country is The Gambia. The entire list of the countries is available below. For the maps of individual countries, follow the links. Africa is a diverse collection of landforms - mountains, deserts, rivers, forests, and others. It is surrounded by oceans at much of its borders, and has the most amazingly diverse wildlife. Mediterranean Sea forms the separation between Europe and Africa. A peninsula named 'Horn of Africa', forms in the easternmost projection of the continent, and it contains countries of Djibouti, Eritrea, Ethiopia, and Somalia. As concerns the climate and weather, Africa displays remarkable contrast. The northern portion of the continent features wide deserts, while the southern portion is mostly green. Since the equator passing right through this continent, the summers can get unbearably hot. This results in extreme weather variations; for instance in the Sahara, where the temperature in winters nose-dives to the freezing point. Another problem the continent faces is rainfall, which is neither regular nor sufficient. Which is why Africa contains one-third of the dry lands of the entire world. However, the vicinity of oceans gives the southern Africa a temperate climate, which is where most of the vegetation is concentrated. Some of the largest, driest, and most menacing deserts are present in Africa. The Sahara Desert in the north of the continent is the largest desert in the world, occupying an area of 9 million square kilometers. That's 90% of the total area of the United States! This and the Kalahari Desert in the south generate giant sand storms that bring much dryness into the surrounding countries. Other deserts are amply spread throughout, in and around countries such as Algeria, Libya, Kenya, Niger, and others. In contrast to the dry deserts, Africa also has impressive rivers. The Nile River is the longest one in the continent, and is famous in the world for fostering the ancient Egyptian civilization. Next comes the Congo River, which discharges the highest amount of water among all African rivers. The arid areas are watered by the Niger River, which flows along half of the length of the continent. There are also many large lakes in Africa, such as Lake Chad and Lake Victoria. The Kilimanjaro is the highest mountain-range in Africa. This dormant volcano range is 19,341 feet above sea-level at its highest point. Residing mostly in Tanzania, it has three volcanic cones: Shira, Mawenzi, and Kibo. Mount Kenya features the highest peak in the country, and the second-highest in all of the continent. This stratovolcano almost touches the equator, and is estimated to the 3 million-years-old. It has 11 small glaciers. Other mountain ranges in Africa are Rwenzori, Atlas Mountains, Bale Mountains, etc. The African history is full of turbulence and conflicts, colonization and freedom struggles. Frequently referred to as the “cradle of civilization,” Africa is the world’s oldest landmass. About 97% of the continent’s land has been virtually the same for the past 300 million years. Between five and ten million years ago, an African hominid called the Australopithecines started to walk upright. This set-in motion a long evolutionary path towards what became approximately 200,000 years ago, the modern Homo Sapiens. Flash forward another 50,000 years, and a group of Homo Sapiens started to move out of North Africa and into the Middle East. While it is estimated that this group may have only contained several dozen people, this was the first migration from the continent, and they would come to populate the planet. Africa has been home to some of the greatest civilizations in human history. One of the most important was the Kingdom of Sheba. The Kingdom was located in modern-day Yemen. The foundation of the Kingdom of Sheba lay in an ideal location along a key trade route. In the period around 1,000 BC, caravans of traders would undertake journeys from the area around modern-day Oman, to the Mediterranean. As they did so, they passed through Marib, which at that time was an abundant oasis. It was also one of the only two sources of frankincense (aromatic resin). The city of Marib was known throughout the Arab world for its great fortunes. The people of the Kingdom were known as the Sabeans. They ruled the region between the tenth to the sixth century BC. The Sabean society collapse came after the spice route was changed. From the 7th century AD onwards, the area around Mozambique to Tanzania was home to a number of highly successful city states. The rulers of these city states were the Swahili Sultans. The people in these city states lived in stone houses and wore robes made of silk. The Swahili Sultans eventually fell victim to infighting, and ambitious viziers and emirs sought to take power from the ruling family. In a weakened state, the Swahili Sultans were very vulnerable, when in the 16th century they came in contact with the Portuguese. Through force and persuasion, the Portuguese were able to turn the region into vassal states. During the 19th century, the various African kingdoms started to come in contact with Europe. This was when colonization of Africa saw a marked increase, and slaves from various African regions were taken to work in colonies and plantations overseas, for instance, in the Americas. But most of the European control was along the coasts. In the inner parts of the continent, the Islamic and local rulers held control. The people of Africa served in both the World Wars. Following the Second World War, the European powers grew weak and the colonies in Africa began to demand freedom. A strong catalyst in this was India's successful struggle for independence. But even after the many nations saw freedom, greater challenges awaited them in the form of famines, civil wars, diseases, and political instability. Even today, the African countries are grappling with these. Table Mountain: Located in South Africa, it is the country's most photographed attraction overlooking the city of Cape Town. Rwandan rainforest: Take a trip down to the Rwandan rainforests and if you are lucky, you might spot a mountain gorilla. Victoria Falls: These majestic waterfalls are known as the 'Jewel of Zambia and Zimbabwe. Pyramids of Giza: Located in Egypt, the Pyramid of King Cheops were built around 2650 BC. It took 2.5 million blocks of limestone to build this magnificent structure. Draa Valley: Located in Morocco, the Draa Valley is home to some of the most splendid landscapes. The Great Sphinx, Egypt: Another ancient masterpiece located in Egypt, the Sphinx is the body of a lion and the head of a human. Masai Mara National Reserve: Pristine beauty, acres of greenery, and abundant wildlife greet the visitors as they enter the Masai Mara National Reserve, southwest of Kenya. It is home to over 450 species of birds, and also holds one of the highest lion densities in world. The Serengeti National Park: Located in Tanzania, Serengeti National Park is famous for its annual migration of over 1.5 million white-bearded wildebeest. It is also home to 250,000 zebras and an untold number of Nile crocodile. Robben Island: located less than 4.5 miles, (7 km) west of the coast of Bloubergstrand, Cape Town, Robben Island is the prison where the former president of South Africa, Nelson Mandela, spent 18 of the 27 captive years of his life. Mount Kilimanjaro, Tanzania: The tallest peak on the continent, Mount Kilimanjaro encompasses multiple climate zones. A towering adventure for anyone.